On the evening of 10 May 2011, Sotheby’s will offer one of the most important works by Jeff Koons ever to have appeared at auction. Pink Panther from 1988 draws on many of the themes that have come to define Koons’ output and stands as one of the outstanding achievements of his illustrious career. The porcelain sculpture is the artist’s proof from an edition of three with the other examples in the Museum of Modern Art in New York, the Museum of Contemporary Art in Chicago and a prominent private American collection, and belongs to the artist’s iconic Banality series that includes Michael Jackson and Bubbles, Bear and Policeman and Ushering in Banality. Pink Panther will appear on the front and back covers of the sale catalogue for the spring Contemporary Art Evening Auction in New York and is estimated to fetch $20/30 million. “Together with Balloon Dog and Bunny, Pink Panther is a 20th-century masterpiece and one of the most iconic sculptures of Jeff Koons’s oeuvre,” commented Tobias Meyer, Worldwide Head of Contemporary Art at Sotheby’s. Representing the highest tier of Jeff Koons’ artistic achievement, Pink Panther is immediately identifiable as a masterpiece not only of the artist’s historic canon, but also of the epoch of recent Contemporary Art. It conflates the classic themes that define the artist’s output – materiality and artificiality, eroticism and naivety, popular culture and rarefied elitism – and is the model expression of one of the most innovative and influential artists of our times. Initially unveiled at Koons’ seminal show Banality, held at the Sonnabend Gallery, New York in 1988, Pink Panther has been emblematic of this remarkable series ever since, which is itself regarded as a landmark of Koons’ oeuvre. In Pink Panther, the display of the woman’s semi-naked body is sensual. However, with the bizarrely incongruous cuddly Pink Panther toy clinging to this literal embodiment of carnal desire, Koons strikes an outrageous contrast between the competing powers of adult and childhood associations. Although the Pink Panther cartoon character was initially created by Hawley Pratt for the opening sequence of the eponymous 1963 film starring Peter Sellers as the bungling Inspector Clouseau, it was only after becoming the protagonist of its own 1960s television show that it entered the mainstream consciousness as a contemporary Pop icon. The artist’s painstaking selection of media is central to the conceptual project, contributing directly to the importance of the work. The terms of its execution are flawless: the contrasting textures of the porcelain surfaces are rendered in dazzlingly vivid colours that reinforce the object’s artificiality, while the transparent glazes simultaneously evoke the fragility of thin glass and the ethereal nature of a reflective liquid. Christie’s presents the mid-season Prints & Multiples sale on July 22. Comprised of a cross section of movements and styles, this well selected offering includes work by James Jacques, Joseph Tissot, James Abbott McNeill Whistler, Paul Gauguin, Joan Miró, Sam Francis, Robert Indiana, Roy Lichtenstein, Jeff Koons, Ed Ruscha and Rachel Whiteread, among others. This sale is the ideal opportunity to begin or expand collections for new bidders and seasoned print enthusiasts alike. A broad selection of Pop and abstract art complete the Prints & Multiples sale. A unique example is A Dedicated Follower of Fashion (estimate: $3,000-5,000) by Richard Hamilton, a founder of the Pop movement in Britain. L’Eté (estimate: $2,500-3,500) by Tissot, is a classic Belle Époque image, embodying the romantic French style of the late 1800’s that glamorized upper class life by depicting the refinement and elegance of the society subject. With an emphasis on opulent decorative details, this image highlights the young woman’s sophisticated and intricate parasol, lace gloves, floral brooch, high collar, and idle gaze. The drypoint technique further embellishes the refined scene as it gives the print a rich, velvety texture. An icon of French academic art, Tissot will be celebrated in an upcoming exhibition at the Brooklyn Museum of Art from October 2009 – January 2010. The abstract art selection is highlighted with prints by Brice Marden, Frank Stella, Richard Serra, Grace Hartigan, and Sam Francis. The sale also includes a complete signed set of 12 offset lithographs by Marcel Duchamp (estimate: $3,000-5,000). Bright orange, blue, green, red and black colors are printed on both sides of six cardboard disks or Rotoreliefs. When spun on a record player they create the illusion of threedimensional space. Typifying his interest in visual phenomena, the animated Rotoreliefs demonstrate Duchamp’s whimsical ingenuity and inventiveness both graphically and in material choice. In addition, the sale features fifteen Pablo Picasso earthenware pieces ranging in estimates from $800-5,000. Picasso demonstrated interest in pottery early on in his life but it was not until a vacation to Vallauris, France during which he visited the Madoura Pottery Studio that he fully engaged the medium. The studio invited Picasso to design and create earthenware pieces that were then reproduced under his supervision in the years from 1946 to 1971. The themes explored in these pieces are classic Picasso motifs, including female figures, bull fights, and a cavalier and horse. After the recent success of Picasso’s Mousquetaire à la pipe, which sold for $14.6 million in Christie’s May 6 Evening Sale, the Prints & Multiples sale offers the prime opportunity to collect a Picasso Musketeer on a smaller scale with, Face no. 130 (estimate: $1,200-1,800). There are also prints by Robert Indiana, including seven of his iconic Love prints (estimate: $2,500-3,500), in addition to prints by Andy Warhol, Tom Wesselmann, Roy Lichtenstein, and a cast iron multiple by Claes Oldenburg. Contemporary Pop artists in the sale include Jeff Koons, Alex Katz, Jim Dine, and James Rosenquist. Christie’s Post-War and Contemporary Art Evening Auction took place this evening and realised £19,063,350 / $31,778,604 / €22,513,816 selling 88% by lot and 86% by value. The top price was paid for Night Playground by Peter Doig (b.1959), 1997/98, an exemplary large scale painting described by the artist as one of his own favourites. It was offered at auction for the first time and realised £3,009,250 / $5,016,420 / €3,553,924, the second highest price for the artist at auction (estimate: £1.5 million to £2 million). A particularly rare urban view, the painting shows night falling on a city playground and portrays the contrast between nature and the man-made. At this evening’s auction, 4 works of art sold for over £1 million / 11 for over $1 million, and buyers (by lot / by origin) were 65% UK and Europe, 29% Americas and 6% Asia. 1025 Farben (1025 Colours) by Gerhard Richter (b.1932) realised £1,385,250 / $2,309,212 / €1,635,980, and was offered at auction for the first time having been in the ownership of the present European owner since 1974, the year in which it was painted. From a series considered to coincide with the most fruitful period in the artist’s career, the work sold this evening is from the last and most accomplished group of colour charts which he painted. Country Nurse, 2003, by Richard Prince (b.1949), one of the largest works created for the artist’s celebrated and highly coveted Nurse series, sold for £1,721,250 / $2,869,324 / €2,032,796. For the Nurse series, Prince mined his own extensive collection of trashy romance novels from the 1950s and 1960s, lifting the protagonists and titles from their lurid covers and immersing them in layers of pigment. An exploration of female stereotypes, the series was subject to great attention in 2003 when Prince photographed Kate Moss for W magazine in front of one of his pictures while she was wearing a suggestive nurse’s outfit. 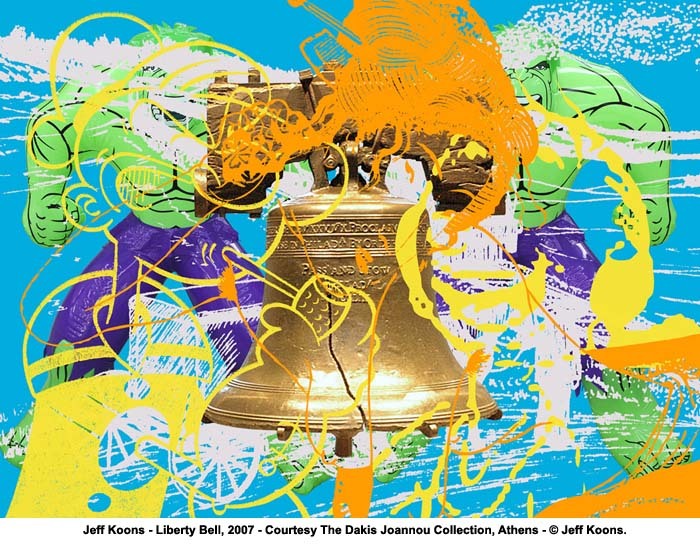 The auction offered 3 works by Jeff Koons (b. 1955) which represented three distinctive moments from the artist’s career, and all of which were offered at auction for the first time. Moustache, 2003, from the artist’s Popeye series sold this evening for £1,105,250 / $1,842,452 / €1,305,300. Flowers, 1986, from the artist’s Statuary series which also included his masterpiece, Rabbit, sold for £337,250 / $562,196 / €398,292; and Walrus (Blue), executed in 1999, sold for £361,250 / $602,204 / €426,636. Untitled, by Cy Twombly (b.1928) realised £802,850 / $1,338,351 / €948,166, exceeding its pre-sale estimate of £500,000 to £700,000. This important work was executed in 1961, a watershed year in the artist’s career during which he created a number of masterpieces including the Ferragosto series which was recently united in an exhibition dedicated to the artist at Tate Modern last year. · Rosso Gilera 60 1232 Rosso Guzzi 60 1305 by Alighiero Boetti (1940-1994) sold for £713,250 / $1,188,988 / €842,348 against a pre-sale estimate of £280,000 to £350,000 setting a record price for the artist at auction. Further artist records were established by Transiente by Julie Mehretu (b.1970) which realized £229,250 / $382,160 / €270,744; and Golden Independent Heart, 2004, a 4.5 metre tall, rotating heart made of plastic cutlery by Portuguese artist Joana Vasconcelos (b.1971) whose work has never before been offered at an international auction and which sold for £163,250 / $272,138 / €192,798 (estimate: £80,000 to £120,000). The Château de Versailles will present the exhibition Jeff Koons at Versailles, which will be held from September 10th 2008, to December 14th, 2008 in the Royal Apartments and in the gardens of the Castle. This unique event will present seventeen Jeff Koons’ works, including his most significant works from the Eighties to these days. Paris is no stranger to rows over modern additions to historic spaces, from Marc Chagall’s fresco at the Opéra Garnier to the glass Pyramid at the Louvre, both now hailed as masterpieces. The project focuses on the close relationship between each work and the space surrounding it. The works have been selected specifically for Les grands apartements at the piano nobile, composed by Les appartements du Roi (The King’s apartments) and Les appartements de la Reine (The Queen’s apartments), which formed a suite of several rooms “en enfi lade”. These large apartments are the most prestigious and important spaces of the Castle, since they were the official halls of the Sun King, composed as one of the richest expression of art and architecture. The works presented in the exhibition have been selected in situ by Jeff Koons, highlighting an inner relationship between each artwork and the theme of the room, or the specific features of the work and the decorative details and the furnishings of the location, such as the original ancient furniture, the stucco elements and paintings on the walls and the ceilings. Koons’ works create a relation with these sumptuous royal apartments, extraordinary expression of the Baroque period and visual representation of the grandeur of the Roi Soleil. The artworks are the icons of the dialogue between Jeff Koons artistic research and the Baroque art, particularly admired by the artist. 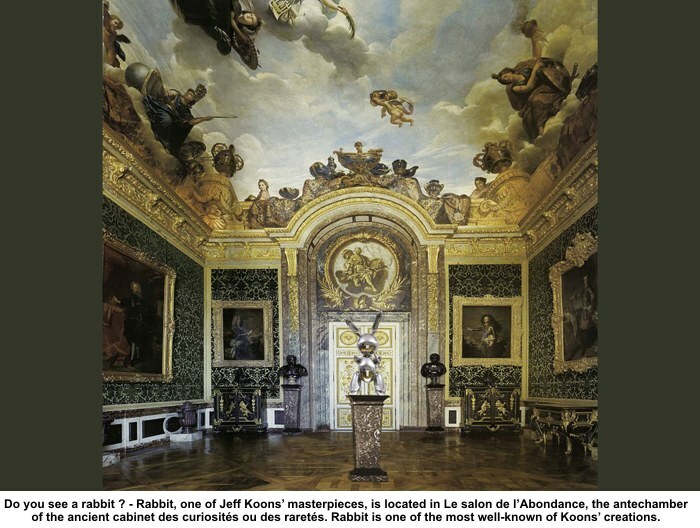 Rabbit, one of Jeff Koons’ masterpieces, is located in Le salon de l’Abondance, the antechamber of the ancient cabinet des curiosités ou des raretés. The work is one of the most well-known and emblematic Koons’ creation. It has a glacial sensuality and lucidity, combined with symbolic levity and abstraction. In the Queen’s apartments, Large Vase of Flowers is a colourful homage to the French Queen and to theme of maternity, since it will be presented in the room in which the “dolphins” – the princes designated to the crown – were born. The work also refers to Rococo, especially to Fragonard and Boucher. Lobster is installed at Le salon de Mars, dedicated to the Greek god and, in the same time, to the planet. The colourful shape and design of the work derive from the inflatable children’s pool toys, but the material used by the artist – polychromatic aluminium – transforms this everyday objects into an unexpected works of art. The exhibition will also include the gardens of the Castle, in which one important work Split Rocker, a sculpture created by ten of thousand flowers, will be installed in the Parterre de l’Orangerie. Flowers are a recurring elements throughout Koons’ work: they are a symbol of life and grace. The work combined two different profiles of rockers – a blue rocking horse and an animated dinosaur – and these split parts are sustained by an interior architectural structure. But even before the show opens, controversy is raging. Rightwingers wrote to the culture minister, protesting that the “sacred” site of Versailles would be cheapened. Then the French media questioned whether the exhibition at a palace that symbolises the French revolution would benefit a billionaire French collector. François Pinault, whose business empire includes Gucci and the Christie’s auction house, is one of the most influential private collectors in the modern art world. Alongside several other private collectors, he is a key patron of the Koons exhibition, lending six of the 17 works on show, including the giant outdoor flower sculpture Split Rocker. Koons told Le Figaro he did not want “to be the agent provocateur”, but simply to “create an abstraction”. The contemporary artist and provocateur Jeff Koons is one of the most well known and intriguing artists of the 20th century. The seductive surfaces, luxurious scale and quality, and flawless execution of his works – many of which have become icons, such as Rabbit, Michael Jackson and Bubbles, and Puppy – transform everyday objects and fantasies into high art. After presenting the first survey of Koons’ work in 1988, the MCA is revisiting the work of this seminal figure in contemporary art, exploring his powerful influence on contemporary art and his significance for a new generation. The MCA exhibition Jeff Koons, on view May 31 to September 21, 2008, is his first major US museum survey in fifteen years and will only be presented in Chicago.